The High Priest Caiaphas is universally considered to be the man behind the crucifxion of Jesus. But was it quite that clear cut? What part did his father-inlaw Annas play in the proceedings? Our play examines these issues. 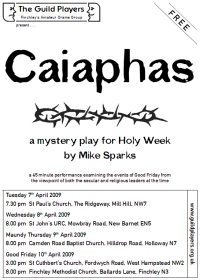 'Caiaphas' is the latest in a series of short 'mystery plays' by Mike Sparks dealing with New Testament issues - looking at events through the eyes of characters who were, or might have been, engaged in the happenings of the time.